Win Chef: Whipping up the perfect foodie film | SWITCH. Carl Casper (Jon Favreau), a once celebrated Michelin-Starred chef, has come to a crossroads in life. After working in a lavish LA restaurant for the past ten years he feels he needs a creative change. His controlling boss Riva (Dustin Hoffman) refuses Carl’s idea of a new tasting menu for food critic Ramsay Michel (Oliver Platt), resulting in a bad review for the restaurant. Carl then turns to social media to vent his anger at his boss, ultimately quitting the job he loves. After leaving his job, Carl is convinced by his ex-wife Inez (Sofia Vergara) to return to his hometown of Miami. He hopes to re-establish a relationship with his son, Percy (Emjay Anthony) and rediscover his love of the culinary arts. One night after dining out at a Cuban restaurant, Inez and Carl reconnect. Inez’ first ex-husband, Marvin (Robert Downey Jr) takes pity on Carl and offers him an old run down food truck. Carl accepts this and restores the truck, giving it new life. He names it ‘El Jefe’. With the help of his son and longtime friend Martin (John Leguizamo), Carl cooks up and serves Cuban sandwiches, known as ‘Cubanos’. With hope in his heart, Carl decides to take the food truck around the country. Not only does he want his food truck business to become successful, Carl wants to connect with his son on a deeper level. The 'Chef' competition has now closed. Winners will be announced shortly. Competition opens at 5pm AEST on Monday 1st September 2014 and closes at 11:59pm AEST on Monday 8th September 2014. Ten winners will be chosen at random on Tuesday 9th September 2014. To successfully win, entrants must fulfil the above entry conditions before the time the competition closes. Current members/followers are eligible to enter the competition. Only one entry per person. Only one winner per household. To be a valid winner, the entrant must not have won a prize from SWITCH within the last 28 days. Each winner will receive one Ultraviolet Blu-ray copy of 'Chef'. By entering, you agree to receive occasional emails from SWITCH in the future. If you decide to unsubscribe from these updates, any further entries will not be applicable. Only Australian residents are eligible to enter. 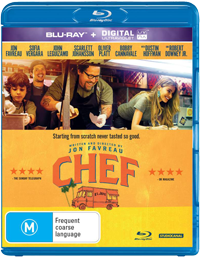 'Chef' is available on Digital, Ultraviolet Blu-ray and Ultraviolet DVD on Thursday the 4th September 2014 from Universal Sony Pictures Home Entertainment.